Many times as music tours are being launched the preparation behind them gets left unnoticed. With custom design elements, these tours take months to prepare and the designers must find new and inventive ways to bring the music to life. 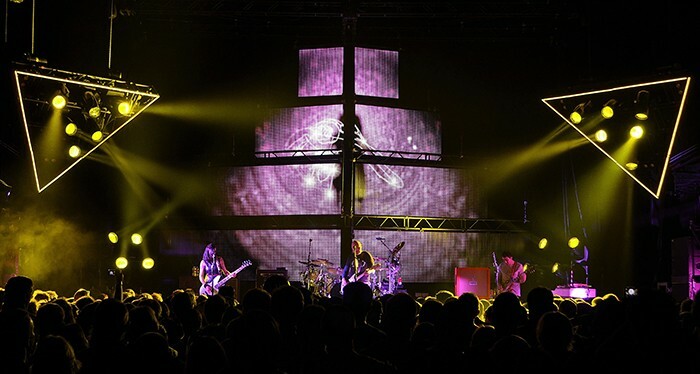 With the Smashing Pumpkins 2013 World Tour "Shamrocks & Shenanigans" lighting designer Lawrence Upton had to find both a new dealer who could support his completely custom design needs, plus find a new lighting instrument to fulfill crucial design elements. He found his solutions in Authorized Vari-Lite dealer LMG Touring, 24 Philips Vari-Lite VL3500 Wash luminaires and two Showline SL BAR 640 LED luminaires. "The Smashing Pumpkins are a powerful and dynamic band with big colorful lighting and you have to keep the visuals fresh," began Upton. "The proof with Vari-Lite is that the VL3500 Wash luminaires are once again my fixture of choice allowing the lighting to match the passion of the music. But then I was also looking for a new light that could provide our crucial front light color wash. I knew Philips Entertainment produced quality products so we took a look at the new SL BAR 640 LED luminaires and they are working great." When production meetings first began for "Shamrocks & Shenanigans" Upton was searching for a new tour provider. To keep this tour fresh, he designed custom pyramid-shaped video walls and needed a custom truss structure to support them. He also needed two additional custom triangle truss structures to house his VL3500 Wash luminaires and it all had to be transportable around the world without needing a full breakdown. Upton continued: "I had previously met with Craig Mitchell from LMG Touring and when I called him up and told him there were a lot of custom elements on the show, he did not hesitate at all to assure me they could provide exactly what we needed, so I flew to Orlando to meet their staff. I was very impressed with the direction the company is taking and with their service and quality control. When you have custom elements in any show you have to be prepared for challenges and work solutions and from top to bottom LMG did a great job. They actually impressed us all on the tour so much that I am now working on new lighting and video custom integration with them." "Working with Lawrence has been a great experience," said Craig Mitchell, LMG Touring national sales manager. "He is an unconventional Designer who likes to go for the big ideas that may seem impossible at first, but he pushes them into reality with his conviction and determination. LMG director of lighting Steve ‘Boz’ Bodzioch designed the custom triangle pods which needed to be able to fit into trucks, sea containers and even airplanes for some of the jumps between countries. It was very exciting to see the whole rig come together in rehearsals and look identical to the original renders. It was an absolute pleasure to work with Lawrence and the Smashing Pumpkins World Tour." With LMG on board, the custom truss structures and pyramid video walls, comprised of 18.75MM LED tiles, came to life. Now needing to add in the crucial color wash elements for the show, LMG also provided Upton with 24 VL3500 Wash luminaires. Wanting to now find a new fixture for his front light color wash, Upton turned to Philips Entertainment Product Manager Brad Schiller who showed him the SL BAR 640 LED luminaire. "A lot of time and effort went into the design of the truss structures and Craig and his team at LMG did a great job," added Upton. "For the lighting elements, power and color are essential to our storytelling and the VL3500 Wash gives me both the color and the power we need. For our front lighting, Brad showed me the new SL BAR 640 luminaires and we soon figured out their potential was only limited to our imagination. While I love how you can create the various effects with the face of the light, for our purposes of front light color washing their color mixing is extremely beautiful providing any color you can think of and the color matching between pixels is seamless." Designed specifically for the entertainment industry to provide strong feature sets combined with high performance LED sources, the Showline SL BAR 640 is a powerful 4-foot LED linear fixture that offers unprecedented output and exceptional color clarity. With 13,360 lumens of output, the SL BAR 640 may be used for general illumination or direct view purposes and the uniform, homogenized RGBW LEDs make a bold statement in any production. Using a standard 60° beam angle, the SL BAR 640 can easily replace outdated R40 strips, border-lights, foot-lights, or cyc lights by providing incredible coverage, beautiful color washing, and exciting animations. Upton explained further, "The SL BAR 640 luminaires are being used for the specific and crucial purpose to provide a color wash for the band downstage right and left. We don’t use front lights, spotlights or overhead lights. The job of the SL BAR 640 fixtures is essential to this design and they are on the band the whole time providing beautiful color." So as the Smashing Pumpkins 2013 World Tour continues to cross the globe, Upton is satisfied that the challenges he faced upon the onset of the production have been overcome. Along with his staple fixture of the VL3500 Wash luminaire, he is confident he has found both a new tour provider in LMG Touring and a new lighting tool to help bring his future designs to life in the SL BAR 640 LED luminaire. "We have such a great relationship with Philips Vari-Lite," concluded Mitchell. The performance and reliability of their fixtures are excellent which is crucial for world tours like the Smashing Pumpkins. The VL3500 Wash is such a powerful fixture and to see these custom triangle pods fly up loaded with them is very impressive indeed. Although this was our first tour using the new Showline SL BAR 640 luminaires, we’ve already increased our inventory for upcoming tours; kudos to the whole Philips Entertainment team for producing another great fixture." "LMG definitely delivered for us on this tour and also a big thank you to our Pumpkin family friend of many years Brad Schiller who helped us with great skill," added Upton. "On festivals we only have approximately two hours to fly lighting, video, backline and monitors. We have three LMG crew members led by Lighting Crew Chief Ray Zwarich and Video Crew Chief Nathan ‘Smokey’ Williams who all get the job done. Along with Production Manager Chris Gratton, Programmer Jon Griffin, Lighting Assistant Todd Erikson, and Video Brain’s Nicholas ‘Frenchie’ Lapoitie, everyone and everything is performing superbly. We are always striving to do something that keeps the tours fresh and we need powerful lamps with great color mixing. You can always go down in gas but you can’t always come up, and the VL3500 Wash and SL BAR 640 luminaires give me the power and color needed to give each song its own unique journey."